Vietnam produces more than 40 million tons of paddy annually which is almost the same quantity in Rice Production (44.7 million tons, statistics). The amount of rice husk is about 20% from the rest of the grain, so there is approximately 9 million tons of rice husk waste per year, which is huge and could otherwise pollute the environment. In fact, husk is a waste that is difficult to recycle, it is also a hardly combustible material that is difficult to rot in the environment. Traditionally, in our country, rice husk has been used as a direct fuel. In recent years, rice husks are processed into firewood and pressed boards for construction and interior decoration. But the amount of rice husk used for these purposes only accounts for a very small proportion of the large amount of rice husk released annually to the environment. There are projects developing rice husks into fuel of thermal power plants but it is considered not feasible due to its economic value. Cattle are also calculated for biomass kilns, but in the Mekong River Delta where the industry is underdeveloped, the biomass does not consume much, so it does not seem to work. On the other hand, the wastes of the above processes are rice husk ash, which is not used for anything, and it is impossible to purify the silica from this ash because of the low content of silicon oxide (SiO2), so investment in this technology is not effective. According to the results of the analysis of the scientists in the rice husk contains a SiO2 ratio of about 15-17%. If the rice husk was cooked in natural conditions as mentioned above, the ash yielded also had a low SiO2 content. If the silica was refined from these ash, the results will be very low.Therefore, the world scientists invented the method of pyrolysis of burning rice husks in special furnaces at specific temperatures to obtain high-SiO2 rice husk ash containing up to 90%. This article will further explain the application of pyrolysis technology to produce high efficiency SiO2. Silicon oxide obtained from rice husks is usually in the amorphous form (powder form), having a particle size of a few microns (μm) with a porosity of 0.0045 μm particles. The huge surface reaches 321 m2 / 1g. It is because of the above characteristics that silicon oxide is very active. - To purify the silicon elements used to make solar cells and semiconductors. - Manufacturing liquid glass, applied in many fields of manufacturing materials. - Additives for the production of high quality automotive tires. - Heat-resistant brick, sound insulation, heat insulation. - Used in the pharmaceutical industry. - Used in the cement and concrete industries. Due to the widespread use of such silicon oxide, the demand for silicon oxide in the world market is growing at an annual rate of 1.5 million tons per annum. Russia alone needs 15,000 tons per year and by 2020 the demand will reach 26,000 tons. In particular, the growing trend of clean energy in the world is increasing, the demand for solar energy becomes more and more urgent, which increases the demand for silicon. For example, in 2016 the demand for refined silicon increased more than 2010 by 100,000 tonnes to 350,000 tonnes. The demand for solar energy growth will increase sharply in the coming years. In today's world, many countries do not have the resources of quartz sand and wet rice farming, but the demand for economic, industrial and scientific development is high.From its Eastern Region, Russia's closest Far Eastern region is Vietnam, which imports 2,500 tons of SiO2 each year, and increasing demand each year. Russia almost imports 90% of its silicon oxide, a few years ago they imported from Brazil, in recent years they imported from India and China. Product 1: High-grade silicon oxide from pyrolysis ash. This unique technological solution developed by Russian scientists, unlike traditional rice husk-burning technology, is a traditional burning technology which includes building materials. In the new technology, ash husk ash is used as the main raw material for the production process. The waste gas is converted into heat, so no hazardous waste is discharged into the environment. The obtained silicon oxide has a purity of over 90%, which can reach to 99.99%. Normally burning of hulls under natural air conditions only yields low-oxide silage hulls. In this technology, the husk is burned in a pyrolysis furnace with controlled temperature control as programmed by the manufacturer. Chaff input materials have an average humidity of 10%, which may be higher but not more than 25%. It is not necessary to dry the husk before putting it in the oven. The boiler has an automatic control system programmed by the operator of the machine first. For example, it can control the furnace to have a 5oC / min, 10oC / min, 15oC / min speed. There is also a braking mode at a certain temperature of 30 minutes or 60 minutes. The furnace system can regulate the automatic valve opening and closing to allow air into more or less depending on the mode required by the technology that the controller desires. This advanced furnace system is very fuel efficient and safe. 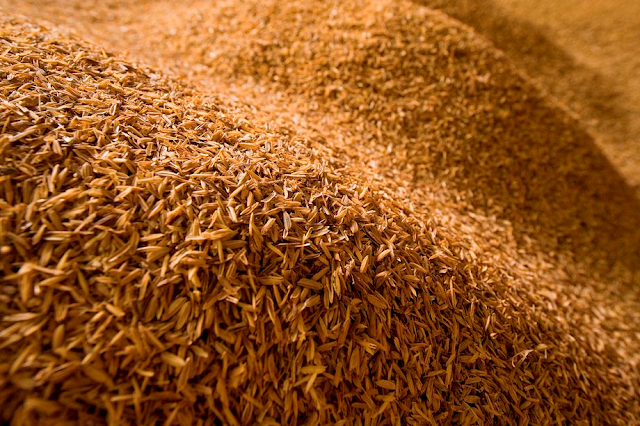 The technology of treating and recycling rice husk into valuable SiO2 and useful heat has been studied, designed, and manufactured into a highly efficient production line in Russia. This technology line not only recycles rice husks into silica but also manages the processing of rice straw into the same field as silica oxide. Implementing this technology in Vietnam will be a valuable contribution to the policy of the Government to develop industrial synchronization in agriculture in order to bring into play the potential of agriculture, contribute to the modernization of agriculture, develop the rural economy, and solve social security. "We, the researchers in materials and renewable energy at the Vietnam Academy of Science and Technology, are very much looking forward to the application of this new technology by Vietnamese managers and businesses. The rice bowls of the Red River Delta and the Mekong Delta believe that the success of the adoption of this technology, will contribute to the added value chain of Vietnamese rice grains that is strong enough to compete in the international market. - Dr. Do Dinh Khang.